Incenitve Design Co., Ltd. is one of a few incentive houses in Thailand travel industry that has been established since 1996. Over the years of our establishment, we have handled many incentive groups for Inbound, Outbound and Domestic. 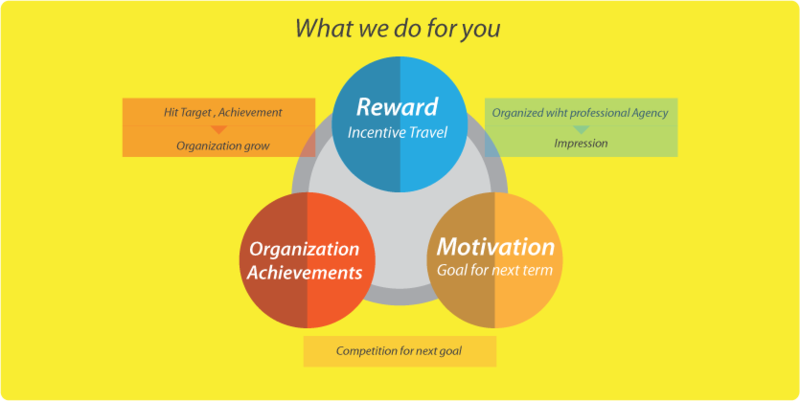 Incentive Design, specialize in tailor-made programme to meet your budget and needs as well as your corporate objective. Besides Incentive Travel, we extend our services to include Corporate Meeting, Convention, Conference, Special Events & Activities, Ticketing and Worldwide Hotel Reservation. Our philosophy emphasizes personalized service with close attention to details. We plan for the perfect event as well as develop the promotional campaign to create and sustain participant enthusiasm leading up to a major meeting or throughout an incentive contest period. We believe that a truly dedicated meeting should involve Leisure and Business in a place ideally suite for the specific proposes. We also believe that we have the right connections to provide the perfect blend of manpower, equipment and professionalism to create the unforgettable experience.